You’ve increased your SEO and opting into your email list. People are even liking your Facebook page and interacting with you on Twitter. One of the mistakes we make in nonprofit fundraising is getting distracted by irrelevant measures. At least, measures irrelevant to fundraising. The primary goal of fundraising is to raise funds. We could have 10,000 people on our email list and 20,000 likes on Facebook, but if we’re not turning those emails and likes into donors, our nonprofit can go bankrupt. Last year, UNICEF Sweden got fed up with that social media engagement alone wasn’t leading to donations. It went on the offensive, attacking slacktivism by attacking their supporters, their message has merit. 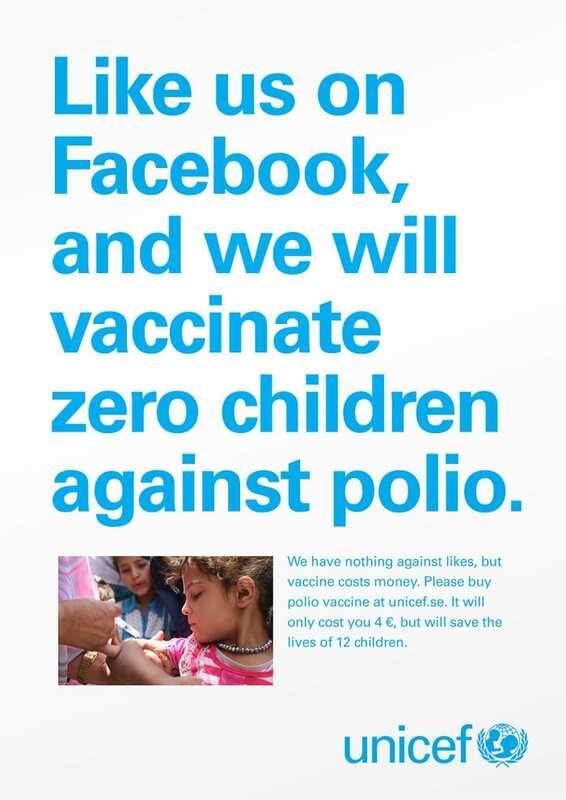 Liking the Facebook page will not result in any more children being vaccinated. Funding will. But UNICEF Sweden fell into the same mistake that many fundraisers make—complaining about their supporters. People don’t just “figure out” that they need to make a donation. They have to be asked. The secret is getting to know people better. Moving people from tweets and likes to your email list is a start. But it’s most helpful to be able to approach people through the fundraising systems you’ve already set up: the one-to-many approach of fundraising letters and one-on-one approach of major gift solicitations. The most immediate way you can move some people from social media engagers to donors is by asking. You can start asking in each platform you use to communicate—email messages, Facebook updates, tweets, etc. Craft a compelling call to action—compelling to them, not to you—and include a URL to your donation page. When they donate, they’ll need to include their address and phone number for the credit card to process. Once you have that, you can fold them into your direct mail and any other stewardship systems you have. The problem with asking on those platforms is that people are at different levels of commitment. Some are just starting to learn about your organization while others have been fans for a long time and are ready to give. Worse, asking incessantly gets old fast. Most people like a page or join your email list because they responded to an advocacy request, support your cause, or find your content interesting. Nonprofits that only ask tend to sound needy and cloying. Most nonprofits have a “prize closet,” or junk closet. Boxes of the leftover t-shirts, golf tees, mugs, and other tchotchke from events. This junk can become social media gold. Try a simple post like “The first 5 people to comment on this post will get a prize from our prize closet” and see who responds. Try mission related trivia. If you’re fighting human trafficking, put some question out that will surprise people and promise a prize to the person with the right answer. In the age of Google, it is a good idea to make the answer a little challenging. But don’t make it so obscure that it frustrates people. The point is harnessing social media engagement to draw people closer to your cause. Not to alienate them. Or just try random questions and surprise people with a prize. The Sexual Assault Response Services (SARS) of Southern Maine found people were much more open to fun when they created a Facebook page for their Chocolate Lovers Fling event. They sometimes post simple things like “Mousse or cake” and get dozens of replies. All they’d need to do is post a comment to “Congratulations to [person’s name] for the wackiest comment! You win a t-shirt from last year’s event!” What makes this work well, is coupling the online engagement with the need to snail mail them a prize. You’re no longer simply asking them for their address. You’re offering them something and simply need their address to deliver it. A subtle but important difference. 3. Or you could combine these. Last year at the FundRaising Success Engage conference in Philadelphia, Lindsey Twombley from HRC explained how she tested a mix of offers to find what most resonated with HRC’s supporters. She tried different schwag (only what they had extra of) and different donation points. She discovered that people responded best to the offer of getting the HRC = sign sticker for a donation of $5. Once people gave the gift, they were entered into HRC’s sophisticated direct mail program allowing them to strengthen the donor relationship. Social media engagement can definitely lead to donations. And it can be used to keep donors giving year after year. But it’s only one piece of the puzzle. And not always the best method of asking for money. By using these steps, you will find you’re able to fund your cause and strengthen relationships with your donors! 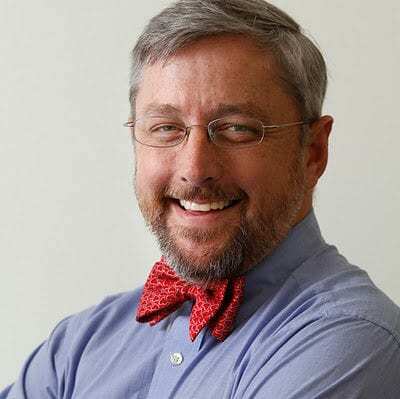 Marc A. Pitman is the author of “Ask Without Fear!” and founder of FundraisingCoach.com and the weekly email service “Fundraising Kick.” Marc’s experience also includes pastoring a Vineyard church, managing a gubernatorial campaign, and teaching internet marketing and fundraising at colleges and universities. Follow him on Google+ and Twitter. Social media can boost a nonprofit’s awareness and donations. But some don’t have the “human” power to handle social media. Also, the board has to get on “board” with social media and running contests. They do work. It would be wonderful if every board members would interact with their nonprofit’s social media posts! I agree. Most board members aren’t social media savvy or don’t see the value of it.